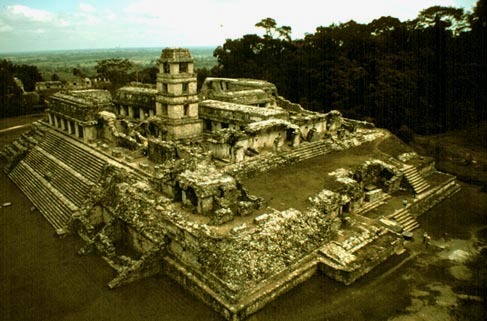 Palenque is a Classic Mayan ruin in the state of Chiapas, Mexico. 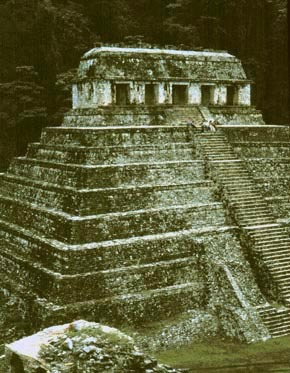 The Temple of the Inscriptions is famed as Pacal's Tomb. 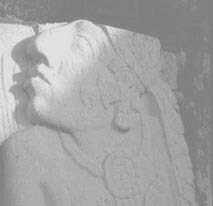 One of the most elaborate burials in a Mayan pyramid is buried deep inside this monument. 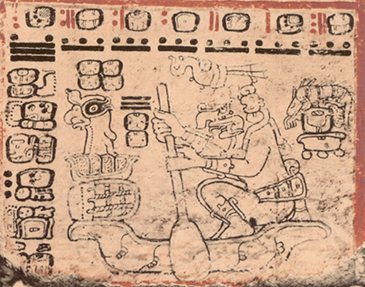 Close-up of four glyphs on a stela at Palenque ruins, in the Temples of the Cross Group. 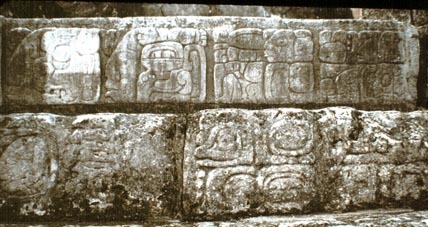 Rooms atop the pyramids at Palenque house stelae with carvings, suggesting that the information recorded was of great significance to the ancient Maya of Palenque. 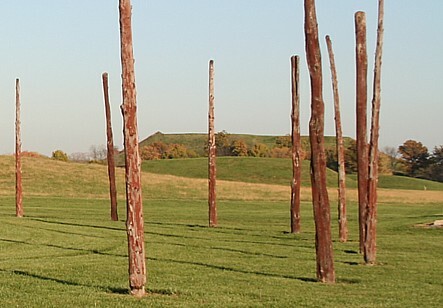 This wide-angle photo shows the entire building topped mound called the "Palace" by modern archaeologists. This wide-angle view is from atop the Temple of the Inscriptions. The Temple of the Inscriptions photo above was taken from the Palace's tower. A telescopic view of the Palace tower from the same perspective. The platform mound below these buildings looks solid, but actually there are chambers and corridors running below the structures. A view of the Palace and the Temple of the Inscriptions from the Temple of the Foliated Cross, one of three pyramids facing the same plaza, called the Group of the Cross. Another view from the Temple of the Sun with the Temple of the Cross in the foreground and the Palace in the background. The Temple of the Sun viewed from the Temple of the Foliated Cross. 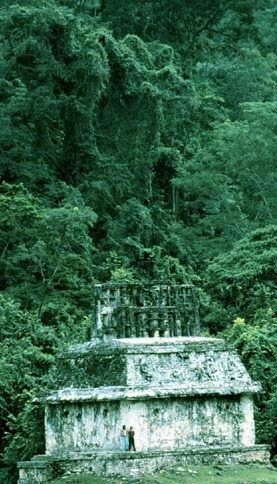 More ruins lie in the jungle behind this monument. 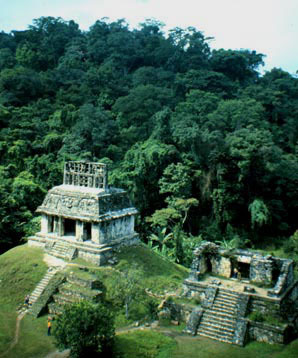 One of the attractions of the Palenque site is the incredible foliage in the surrounding jungle. 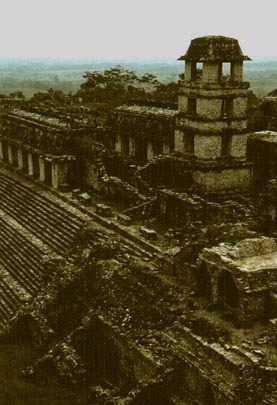 A telescopic view of the Temple of the Sun from the Palace tower, with draping jungle vines in the background. 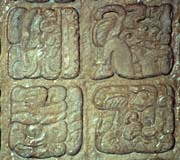 A group of stelae adorn two sides of an internal stairway in the Palace. This figure seems to be looking skyward. The stone decorations also include hieroglyphs on a stairway. 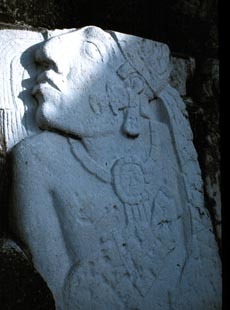 Most of the surfaces of the palace were elaborated in full relief, painted stucco sculptures. 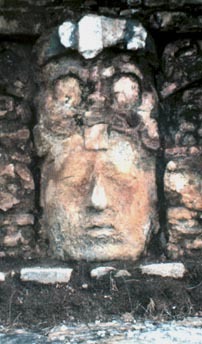 This head is a unique image at the site. Unlike most of the personages displayed in the art this figure is much larger than life-sized.